I received two À La Carte Projects from Home School in the Woods for free and was compensated for my time. All content, thoughts, and opinions are my own. I was not required to write a positive review of their materials. For more details, read my disclosure policy. Hands-on history projects are a wonderful way to make history lessons come alive for your kids. Now, you don’t need to do a hands-on project every day - but a few well-planned projects can make all the difference. Give you a better understanding of the time and culture. Can help you see historical context and how events and people are related. Engage kids in their learning. But when we find ways to engage our kids in their learning, it makes such a difference. You can do this will read alouds, interesting assignments, and of course, hands-on projects and activities. Engaging the minds (and hands) of our kids makes all the difference in their educational experience. Now that you’re convinced to add some hands-on fun to your homeschool day, how should you do it? Don’t fill your days with meaningless activities. One well-planned and executed activity each week will go much further than a day filled with boring and mindless activities. Best of all, you don’t need a pile of activity books or resources. With just a handful of ideas that can be applied to any time period or culture will be just as useful. When you’re immersing yourself in the culture or time period, take a look at the art from that era or geographical area. Artists, their lives and artwork give us a glimpse of life during that time - how the people dressed and what was important to them. Lapbooks and notebooks are a great way to create a capsule of all the things your kids are learning. They can create little mini-books and interactive booklets filled with details about the time period, the people, the culture... really, anything that interests them. They are a great choice for research assignments. Kids can research a specific topic and include the information they find in their lapbook or notebook. Best of all, a completed notebook or lapbook becomes a great addition to your year-end portfolio - displaying everything your kids have studied and learned that year. Well-thought-out activities can really immerse you and your kids in the culture and time period of a certain people. Confession: I know so much about ancient Egyptian history (believe me, I knocked it out of the park watching a recent episode of Jeopardy and knew the answer to every question for that category!). Why did that happen? Because of how we’ve immersed ourselves in our lessons during that subject - researching maps, making our own fruity mummy, reciting a list of important pharaohs, reading the myths and stories of the people. I love to include games whenever I can - they are such a great learning resource. And who wouldn’t rather play a game than fill out a worksheet?!? It can get expensive buying games for every time period you study. Instead, make your own! For just a few dollars you can purchase downloadable plans for games that you put together yourself. Tip: we love to listen to audiobooks while we color, cut out, and assemble our game boards. We love the games from Home School in the Woods (we’ve used quite a few over the years) and we’re so happy that they now offer them as À La Carte downloads - you can purchase one or two games for the time periods you’re studying. Understanding how one country fits into the geography of an area brings a whole new level of understanding about that place. Taking time to study that country - its hills, borders, mountains, and other details - can help you see their culture and life in a new way. You can look at historical atlases or maps, color or draw your own map of the area, or make it more hands-on with a salt-dough or shape a map with sugar cookie dough (and decorate it with various candy bits!). 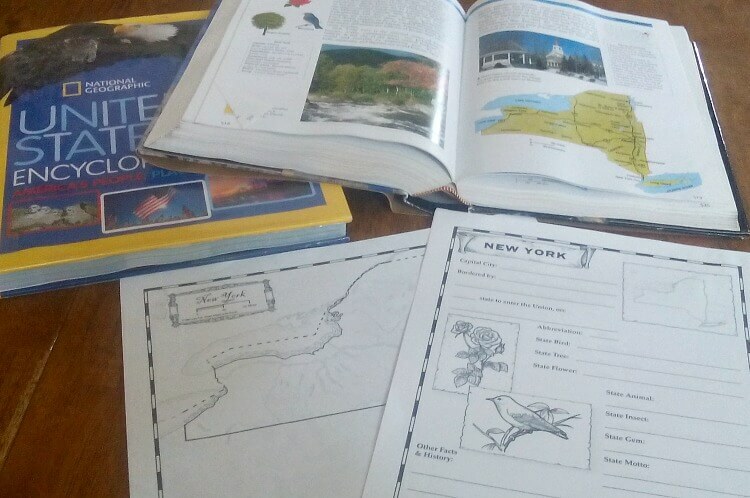 For printable maps, I love the quality of the maps from Home School in the Woods. They can easily be added to any curriculum or resource. Does the country or historical era you’re studying have any interesting buildings or inventions? Build a 3-d construction! Want to learn about the pyramids? Build one out of sugar cubes. Leaning Tower of Pisa? Oreos and frosting. Of course, you can also use other supplies if you don’t want to build with sweets. Printable models are easy to use (and don’t require a special shopping list!). You’ll find a few printable models in the A La Carte section at Home School in the Woods. A history timeline is a wonderful project that every middle school child should create. Seeing how historical events and people fit together gives them a better understanding of historical context and how all those events and people are interrelated. You can create one large timeline for the whole period you are studying or, if that feels a bit overwhelming, smaller topic-based timelines can be just as useful. For those kids who love journaling and creative writing, history is a great place to let their creativity run wild. They can journal as if they lived during that time period, ‘interview’ a famous figure of the time, or create their own writing assignment ideas. As you can see, it isn’t that difficult to include some hands-on fun to your history lessons. With a few well-thought out ideas that can be applied to any history or culture you’ll easily be adding some fun to your history lessons. The hardest part is finding the right resources! Thankfully, Home School in the Woods makes that part very easy for busy homeschool moms. With their À La Carte Projects you don’t have to purchase a full program - you can purchase just a few projects that will bring your history lessons alive. And, they can be added to any curriculum or program! We’re focusing on modern history this year. My daughter’s one complaint is that it feels like studying war after war, which isn’t all that exciting or interesting for a creative middle school girl. Instead I try to focus on the people and exciting inventions of the time period. And, when we do focus on the major wars of the period, we’ve been using a few of the À La Carte games to make it a little more fun and interesting. She certainly doesn't complain when I say that our history lesson for the day is playing a game from Home School in the Woods! How do you make history fun and interesting in your homeschool? Do you have a great tips for adding some variety and fun to your homeschool history lessons? Share your tips with us in a comment below!